If you spend a lot of time in Photoshop, chances are you use—or would benefit from—a tablet instead of a mouse. 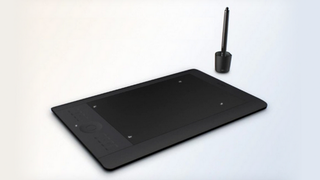 Wacom's offerings tend to be some of the best, and their new Intuos5 range seems no exception. The new Intuos5 tablets come with multitouch gesture support and "Express View" head-up display software, alongside a rather pleasing soft-touch feel. They now support all the standard Mac and Windows multitouch gestures—hello Windows 8—simultaneously with pen use. You can create custom gestures, too, while the head-up display shows current tablet settings on your computer screen.